Savannah cats are a hybrid breed created by breeding and African Serval to a Domestic Cat. We at Belle Hollow have been breeding Savannah for more than 10 years here in the mountains of western North Carolina..
As a breed savannahs are an extremely active and intelligent breed. They are bred to mimic the appearance of the African Serval with the pleasant and playful disposition of a true companion cat. The appearance of the savannah cat should be that of the serval ancestor, long and lean with larger than average ears, long necks and legs. Many savannah appear to be larger than they are because of this length of body and bone. Savannah cats are rarely over 25 pounds unless they are simply overfed fat cats. Because of their wild bloodline Savannah Cats are smarter than the average house cat and are easily trainable. Savannah’s can be taught to walk on a leash or fetch toys like a dog which is why the breed is often described as “Dog-Like”. Early generation Savannah cats, F-1 through 3, are generally more challenging for the average cat owner as they display more of the wild behaviors of the serval. That said, Servals have been maintained as pets for 4000 years and for the right owner an early generation savannah cat can be a very special and beloved companion. Early generation cats tend to be larger than later generation cats but there are exceptions with some F-1 savannah cats being very average cat sized and some F-6 savannah cats being huge. For many owners the later generation and more affordable kittens are just what your family is looking for. Kitten are often described to include their “code”. See the following for an explanation of the coding and how it may affect the savannah you may wish to own. The first generation offspring of the pairing of a serval and a domestic cat are refereed to as F-1 savannahs (first Generation hybrid). These cats are very difficult to produce and carry a huge price tag. The next is F-2 and so on. Each subsequent generation is generally a little more affordable and easier to acquire. Only in the F-1 generation is one parent a serval. 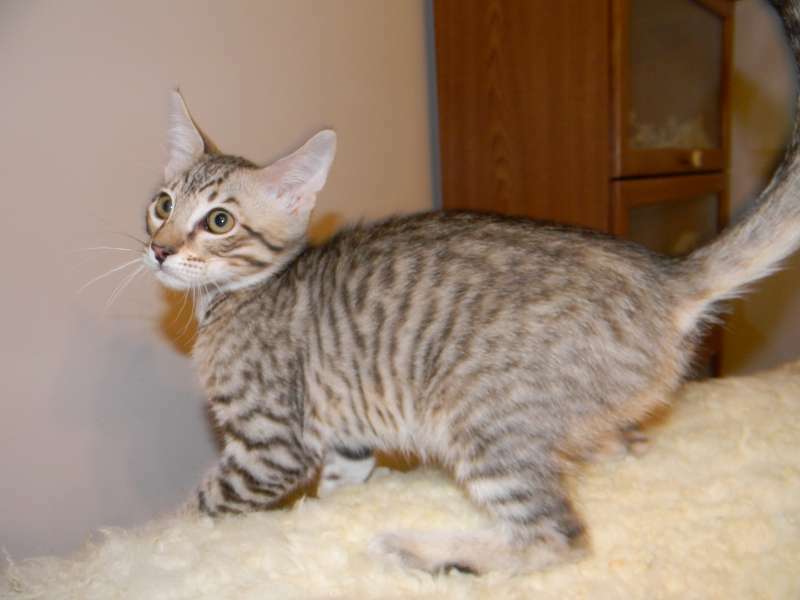 All subsequent generations are created by breeding a fertile F-1, 2, 3 etc female with either a late generation savannah cat (F-4,5, 6 etc) male or a male of another breed which brings desirable traits to the breed. F-1 through 3 savannah mles and most F-4 male savannahs are sterile. Later generation savannah males may also be used with out-crosses to improve the breed. Egyptian Maus are often used here at Belle Hollow as “Out-crosses” because they are the only naturally spotted breed and have extremely stable and loving dispositions. Oriental Short-hairs and Siamese both man-made breeds bring big ears and wedge shaped heads. Serengetis and Ocicats also man-made breeds offers spots and golden color. When out-crosses are used to improve the breed the kittens will carry A,B,C or SBT in their registration numbers. These letters represent the number of generations from an out-cross. An “A” means that one parent is an out-cross, “B” means one or more Grandparents are out-crosses, “C” means Great Grandparents maybe out-crosses and SBT (Stud Book Traditional means that the kitten is at least 4 generations of savannah to savannah breeding. Only SBT savannah kittens are eligible for championship points. A, B and C cats are registered as Foundation Savannahs and are truly the backbone of the breed. 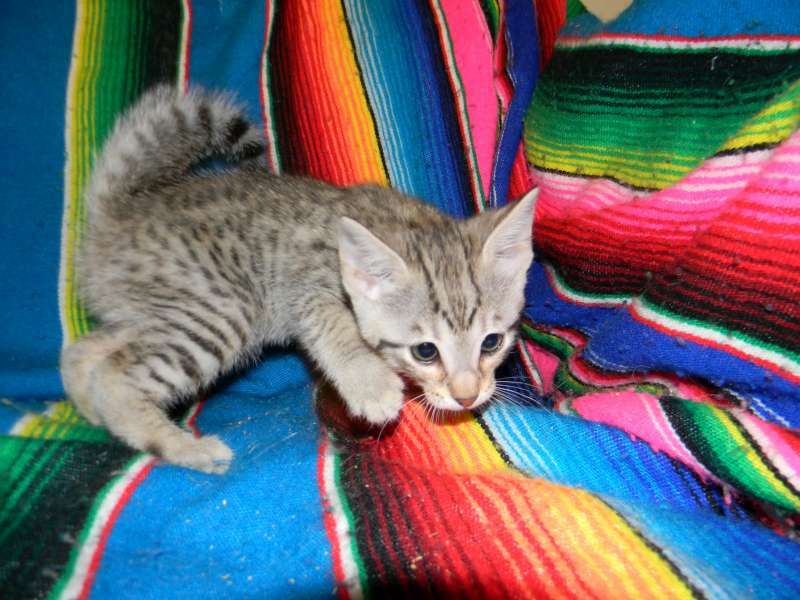 Unless you are interested in Breeding or Show an out-crossed kitten can be the Purrfect pet you are looking for at a much more affordable price. 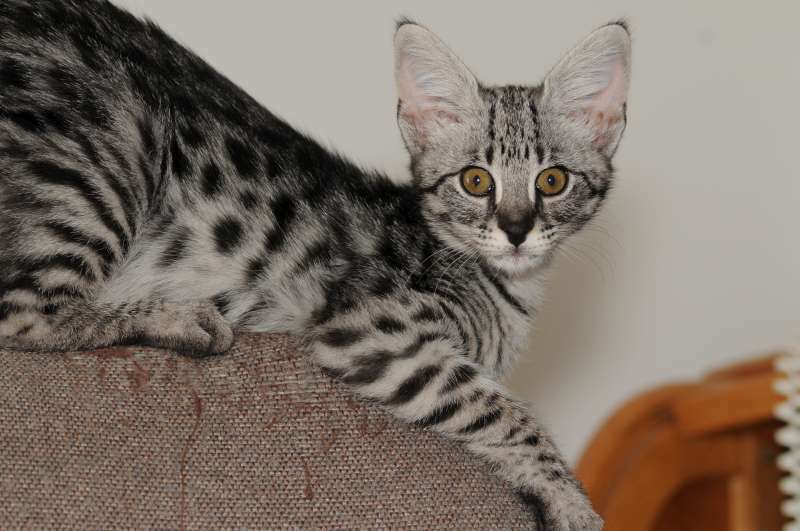 Belle Hollow breeds all generations and letter designations of savannah cats making our cattery able to provide the furry friend you have in mind on any budget.